Dianne K. Salerni lives in Chester County, Pennsylvania with her husband Bob, her two daughters, Gabrielle and Gina — when they’re not at college — and her mischievous cat, Luna. She graduated from St. Mark’s High School in Wilmington, Delaware and attended the University of Delaware and the University of Pennsylvania before taking a job teaching in the Avon Grove School District. She taught fourth and fifth grade there for 25 years. Now retired from teaching, Dianne spends her free time hanging around creepy cemeteries and climbing 2000 year-old pyramids in the name of book research. She loves visiting the Pocono Mountains of Pennsylvania, especially to ski. Since the death of her family’s beloved German Shepherd, Sorcia, she has been volunteering at her local rescue animal center, CompAnimals, walking dogs and taking them on outings. Dianne’s first novel, We Hear the Dead, is a YA historical based on the real story of 19th century teenage spirit mediums Maggie and Kate Fox. We Hear the Dead was the inspiration for the Canadian-produced short film, The Spirit Game, which premiered at the 2013 Cannes Film Festival. 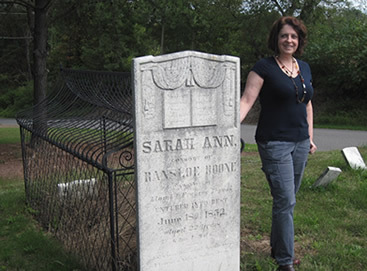 Her second novel, another YA historical, The Caged Graves, is a Junior Library Guild Selection and was inspired by two real caged graves in an abandoned Pennsylvania cemetery. Although Dianne has left teaching as a full-time profession, she loves hearing from students and their teachers and occasionally teaches workshops and community college courses. Participants in those courses can find their resource pages with links referenced in class below.